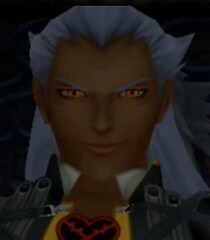 Mwa ha ha... You called my name, Riku... You're thinking about me... You're afraid of the darkness I command. Good... The more you think of me, the closer my return draws. And when I awaken...(appearing) Your heart will be mine! Did you really think you could harm me? A weakling like you couldn't even defeat Sora and you had darkness on your side. You need the darkness. Submit! Bow to the darkness, and bow to me. Oh, I know what you can do. Your skill with darkness has matured. But I do not understand. Why accept darkness and still refuse me? You and I are similar. We both follow where the darkness leads. We exist in the same space so why deny me? Perhaps some part of your heart still fears the dark? Good, Good, give in to your hatred. There is no light without darkness, & no darkness with light.